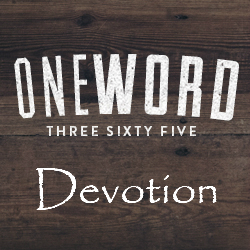 The purpose of One Word 365 is to put aside the usual New Year’s resolutions that we never seem to keep. Instead, you pick one word. Just one word that you want to spend the year focusing on and living out… whatever that may mean for you, personally. I’m a bit early with this for the new year, but I’ve been thinking about it a lot lately. My One Word for 2019 is devotion. 2018 has been a year of spiritual growth for me. I faced a surgery with a peace that I know could only have come from God, and that I know I didn’t possess just a couple of years ago. I find myself at peace and content in situations that, in the past, would have left me frustrated and angry. I’m in church again after a lifetime of spotty attendance at random places, and I’ve never felt so at home. I owe God so much, and that starts with my devotion. I’ll be cutting back on reading fiction in 2019 to focus more on books about God, faith, and the Christian life. I’m also limiting myself to one book at a time so I can truly focus. Do you have a One Word for 2019? Drop a comment below and tell me what it is. If you have a blog post about it, leave me a link.